Avg. Group Discount of 8.3%! Located in the heart of downtown Reno, riverwalk and kayak park, art museum, automobile museum, live theater, concert and major event venues, shopping, restaurants, etc. Rooms were comfy and good. I was kind of disappointed there were usually complimentary drinking water in the rooms. Customer service is excellent. 27-Jan-2019 Verified Review, stayed from Sat Jan 26 to Sun Jan 27 2019 at a $96.25 average nightly rate. Thank you Jose for your feedback, I have your forwarded your comments to our hotel director. Located in the heart of downtown Reno, Nevada, the Circus Circus is connected to the Silver Legacy and Eldorado Resorts on the mezzanine level. The mezzanine is fully enclosed with restaurants, bars and lounges, shopping as well as gaming opportunities along the way. In total, all three resorts offer over 22 restaurants, 9 entertainment venues, fitness centers, shopping and more.Circus Circus nearly 18,000 sq. ft. of flexible convention and banquet space. 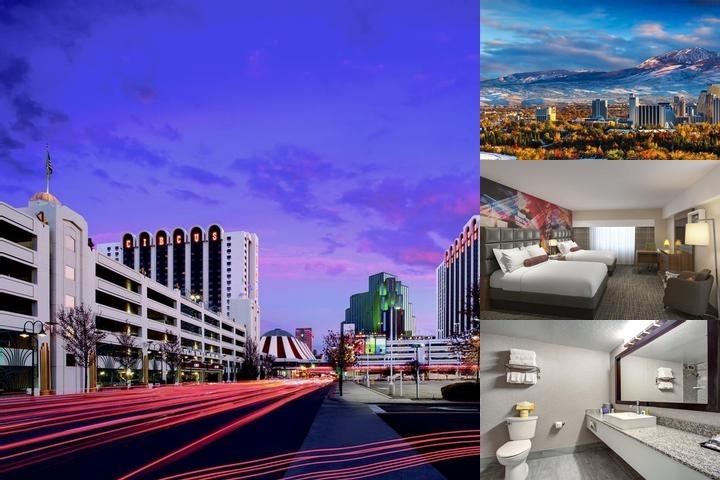 Hotel Features – Circus Circus Hotel & Casino Reno has more than 1,500 rooms and suites with stunning views of the Sierra Nevada Mountains and vibrant downtown Reno. Guests can choose from standard rooms with double queen or single king beds, or opt for more space in one of the suites. The casino floor features slot machines, table games, race and sports betting, and a poker room. Meeting, convention, and event space is available for weddings, reunions, and anniversary parties. Guest Rooms – All rooms at the Circus Circus Hotel & Casino Reno include cable TV, alarm clocks, hair dryers, air conditioning, in-room coffee, irons and ironing boards, and a writing desk. Mini Suites feature a separate bedroom with a king-sized bed and a living room area with a queen-size pull-out bed and armchair. The VIP and Executive Suites have numerous upgrades, including marble flooring, cherry oak furnishings, large jetted spa tubs, and separate dining area. Perks & Amenities – Connecting rooms at the Circus Circus Hotel & Casino Reno can be requested and depend on availability. The hotel’s resort fee includes valet parking, free local phone calls, airport shuttle service, high-speed Internet access for one laptop, and admission to the fitness center. Parking is plentiful and free, and can also accommodate RVs. Other services available for a fee are use of the full-service business center, rollaway beds, mini refrigerators, and same-day dry cleaning. Scooters are available for rent, and there’s even a dog kennel. Expert Tip – Guests may find they don’t even need to leave the hotel property, thanks to the retail and dining opportunities at Circus Circus Hotel & Casino Reno. There are six restaurant choices, including Smokin’ Gecko’s BBQ, Courtyard Buffet, The Steakhouse at Circus, Kokopelli’s Sushi, Main Street Deli and Americana Café. Reno Tahoe International Airport located 5 miles from the hotel. Circus Circus offers complimentary roundtrip airport shuttle service that runs to and from the Reno Tahoe Intl Airport. Local Shuttle Info: Circus Circus offers complimentary roundtrip airport shuttle service that runs to and from the Reno Tahoe Intl Airport.Our resort is 8-10 minutes from the airport. 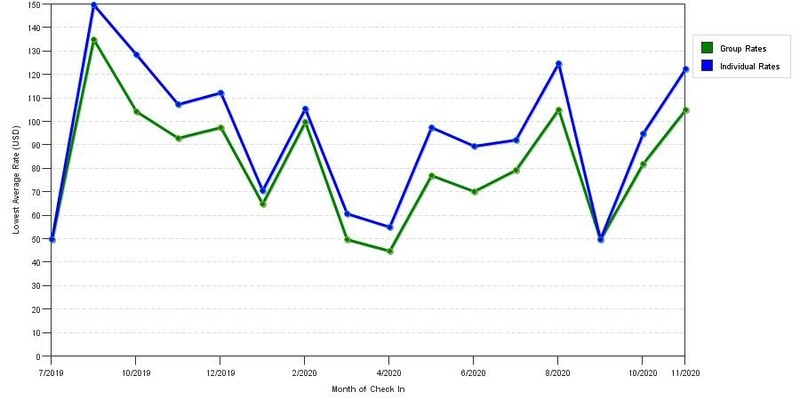 The graph above is fluctuations of room rates for both group/meeting quotes and the lowest online individual prices we could find at the time the group/meeting bid was entered. The most competitive group or meeting displayed is 57.4% in the month of October 2018 and the highest average individual rate is $210 in the month of October 2018. This chart will show past seasonality and also project future months. If you are flexible with dates, you may want to consider staying at Circus Circus Hotel & Casino Reno in a month when rates are lower. Below are the meeting, banquet, conference and event spaces at Circus Circus Hotel & Casino Reno. Feel free to use the Circus Circus Hotel & Casino Reno meeting space capacities chart below to help in your event planning. Hotel Planner specializes in Reno event planning for sleeping rooms and meeting space for corporate events, weddings, parties, conventions, negotiated rates and trade shows. Our 8,126 square foot Mandalay Ballroom is an elegant space for a banquet or meeting. The ballroom can be divided into two rooms - Mandalay A is 4,760 square feet and Mandalay B is 3,366 square feet. 72 x 121 x 16 Ft.
Six breakout rooms surround the ballroom, and air walls allow the entire area to open up to over 17,000 square feet of adjacent meeting and banquet space.Our courteous and highly trained staff provides exceptional service to not only experienced meeting planners, but to the beginning planners and reunion coordinators who look to us to assist them. From arranging room accommodations to planning banquets and activities, we will provide detailed assistance. We believe that all events, large or small, deserve equal attention and respect. 31 x 34 x 8 Ft.